This is part of my Photography HOWTO series and follows on from Basic Composition. I will be looking at basic lighting techniques and how to use them. Lighting is arguably the most important factor in taking a good photo, but probably also the least understood and appreciated. When it comes to light, what most people are concerned about is the quantity and not much else. Simply trying to get the most light often means that the quality of the light is compromised - in the dark, they just blast away with a flash, in sunlight they put the subjects squinting into harsh direct sunlight. Once there is sufficient light for a good exposure (see previous article), the quantity of light is of little consequence. It may even work against us in that we are forced to stop down more than optimum for the composition we are trying to achieve. The important thing with light is the way it creates shadows on the subject. Humans have two eyes and always see in 3D - a conventional camera has only one lens and hence only captures a 2D image. What gives the perception of depth to a photo is the way the shadows fall across the image - this also plays an important part in setting the feel and atmosphere in a scene. For example, an image with sharp shadows and sparkling edges on shiny objects would suggest bright sunshine, but with little or no shadows and "flat light", it would suggest an overcast day, when in fact both scenarios may have been artificially created in a studio. There is much more to light that I use regularly with every commission I take on - the way light falls on someone's face can suggest trustworthiness or untrustworthiness, the way it falls across a product it can suggest luxury or practicality, it can suggest gloom, in fact, it is one of the most important aspects in taking a photo with impact and is a key factor in setting the mood of the shot. No surprise then that so much of the time taken when setting up a shot is in fact spent setting up lighting. There are 2 basic components that make up the appearance of shadows - light angle and light size. The important thing with the angle of light is to understand how the shadows fall. What we need to achieve is a distinct difference between surfaces facing different directions. This means that the light should not be coming from where the camera is (ie. avoid using the built in flash) - that would result in shadows behind the subject where they can't be seen and can't contribute to the 3D look of the photo, hence the term "flat light" since it makes everything look 2D. The larger the angle of the light away from the camera, the more shadow we will see in the scene until it is completely behind the subject and we get complete shadow (silhouette). The best angle depends on the subject, and the image we are trying to create. The size of the light source determines how sharp or soft the shadows are. A small light source produces very sharp (harsh) shadows (ie. avoid using the tiny built in camera flash - it's very harsh), where a large light source produces soft, gradual shadows. For a small light source, shadows fall off rapidly behind a barrier. Imagine walking up the right edge of the diagram - you would be in complete darkness until the edge of the light source comes into view, after that it is just a short distance before you can see the whole light source and you are fully lit. But for a large light source, they fall off gradually. As above, imagine walking up the right edge of the diagram - you would almost instantly see the far edge of the light source, but it would be much further before the whole light source was in view and you where fully lit. An important thing to understand with light size is that it is also related to how far the light source is from the subject. For example, I may setup a shot with a 100cm soft box about 100cm away (ie. a 1:1 ratio) from the subject and get smooth, soft, rounded shadows. Put the same subject in sunlight (the sun is 140000000000cm across - much bigger than the soft box), but then I get sharp, harsh shadows. The key thing is that the sun is also 14947600000000cm - that's about a 1:100 ratio, or about 100 times the relative distance for the same size. As a result, the sun's shadows will fall off about 100 times faster and give about 100 time sharper edges. As a general rule, with most small things (people, products, food etc.) we want soft shadows (ie. a large light source relative to distance), and moderate light angles. We may push this to extremes in cases where we want a distinct smoothing effect (often used in fashion photography). With larger subjects (landscapes, buildings etc.) we often want sharp shadows and more oblique light angles to sharpen and emphasise the shapes and textures. These are just general rules of thumb, and in many cases we may deliberately use a different type of lighting to achieve a specific look or mood to the shot. The important thing as a photographer is being able to control the light to get the desired effect. This is easily done with artificial studio lighting where I can adjust the levels of different lights, position the lights where I want them and use a variety of light modifiers (softboxes, reflectors, snoots, spots, gobos etc.) to control the size and shape of the light, but for most people, they need to make use of the light that is around. There are generally 3 things that we may have control of in natural light: timing, our (camera) position, and sometimes the subject position. Why timing is significant with light, is that the main natural light sources (eg. sun) move, change colour and size (eg. go behind a cloud creating a large light source) with time. Timing of a shot can be the single most important aspect with natural lighting. When I am doing architectural work, I will often reckie the site and examine the options on Google Earth before deciding on an optimum time to shoot the building. Likewise, weather also alters the light dramatically. A heavily overcast day will give a very flat light with minimal shadow. This is seldom an ideal for any subject as it will reduce the 3D effect (depth) as described above. With older "square" buildings, I prefer sharp light which matches the sharp angles and geometric pattern of the building, but many modern buildings have curves or are completely round. With these I sometimes opt for softer shadows to help show the curves. For soft light I look for a day with a small amount of cloud around - when the sun goes behind a light cloud, the cloud lights up like a giant diffuser providing softer, more gradual shadows. This can also be good conditions for shooting people - it gives sufficient shadow for depth to the photo, but avoids harsh shadows from direct sunlight. For landscape photography, early mornings or evenings often give ideal conditions - the sun is low and the angle produces distinct shadows on the ground. If you flip through a book of landscape photos, you will almost certainly see early morning or late evening shots - very rare to see a great landscape photo taken during the main part of the day. Along with the position of the natural light source (see above), we can often move the camera position, and also the subject (eg. people). We have the light behind us so we get minimal shadows to the sides, but if the sun is high we may get strong vertical shadows. The light is directly behind the subject so we only see shadow and we don't get the depth perception we are looking for. 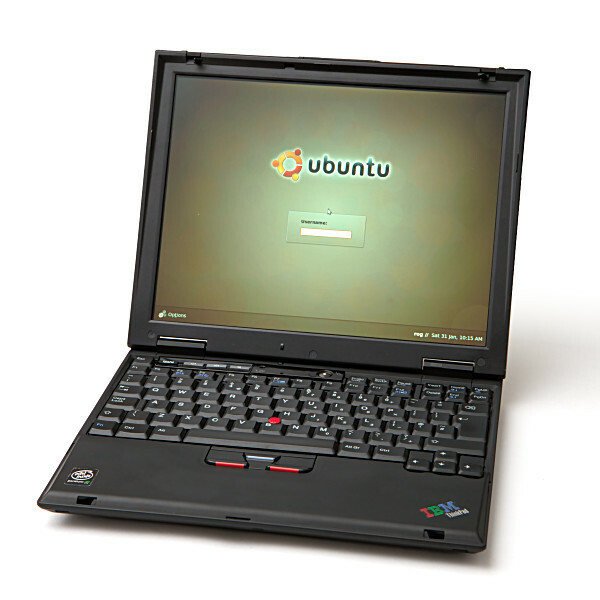 For people, this can still be a good position as they are not squinting into the sun and have highlights on their hair. This is often used with fill flash (see below) to balance the shadows in their faces. The light is directly to the side (and there is a mirror of this on the other side - not shown), we get very distinct shadows - about 50% of our subject will be shadow. In this case, the shadow may be good for geometric objects and landscapes, but may be too strong for people. Some very moody masculine shots can be done in this lighting, but women will likely find it unflattering. The light is coming from over our shoulder - often considered the ideal lighting for people, about 45 degrees from the light source both vertically and horizontally (called Rembrandt lighting after the painter who pioneered this lighting). With a sharper light source, it is often better to reduce the angle further to avoid big shadows - this is often the case with TV lighting where it is often not practical to use big softboxes, and the lights are often set to just drop the shadow down the side and underneath the nose. It is important when using bright light sources in this position with people to ensure that they are not squinting into the light. The light is to the side in front and we get about 70% shadow. This is good for emphasising textures as it gives distinct shadows to even the smallest objects. This is often a good lighting for landscapes where textures on the ground are emphasised. The built in flash in cameras is almost universally to be avoided. About the only thing it may provide is enough light for taking photos under conditions when natural light is not sufficient or fill flash (see later), but it is a very small light source and will result in very sharp, harsh light, and as the light is coming from the same angle as the camera, minimal shadows. With people it also puts a reflection of the flash right in the centre of the eyes where is it very distracting, and may also result in the infamous "red eye" as the light bounces back off the back of the retina. With studio flash we can avoid these problems by moving the lights to where we need them and fitting light modifiers to change the size of the light source, but there are a few tricks that are possible with small flash systems like built into cameras, and hot-shoe flashes (the ones that slot onto the fittings on the top of SLR cameras and some advanced compact cameras). I don't intend to go beyond these types of flashes for this set of articles. High end hot-shoe flashes from manufacturers such as Canon and Nikon as well as others (and third-party compatibles) often have the ability to operate together with wireless control, or at the very least use an off-lead to move the flash off the camera. 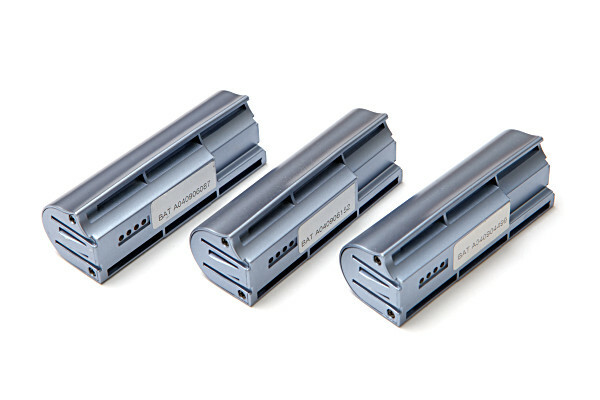 These give the freedom to move the flash away from the camera and position it to achieve the desired lighting. Options include using a flash frame (moves the flash away from the camera) or even just hand holding the flash above the camera achieve lighting closer to option 4 above. There are even fittings to be able to use these flashes more like studio flash by adding umbrellas and other fittings to modify the effective size and shape of the light, and mounting them on standard lighting stands. I use Manfrotto fittings MN026 with a hot shoe adaptor for mounting to the flash (Canon 550EX in my case). This allows me to have a very portable battery powered flash system with automatic (E-TTL) wireless functionality for less critical work where I am forced to work with minimal equipment. The whole setup is compact enough to carry around in a small camera bag (with the exception of stands and brollies) which means it is easily carried on public transport. 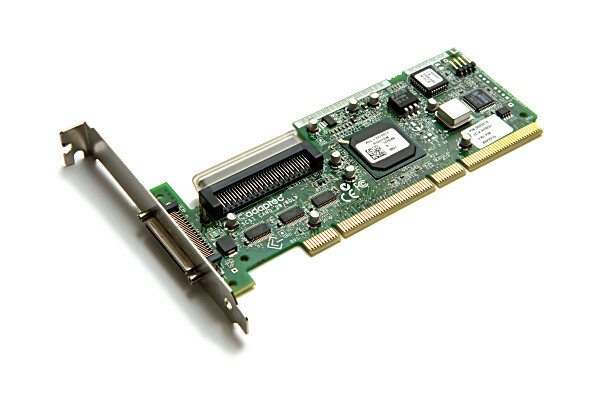 With high-end hot shoe flashes, a number of third parties (eg. Lumiquest, Stofen, Gary Fong and many others) produce light modifiers that attach to the flash. The flash may still be used with off-leads or in wireless mode, but with these modifiers are often still used mounted on the camera. Your results may vary with these - in my experience, only the very largest direct lighting fittings increase the light size sufficiently to be of significant benefit unless you are getting very close to the subject, but these light modifiers are none the less popular, especially in press photography where it is simply not practical to use any more elaborate techniques. One thing to beware of with advertising for these units is that they often show the "without" photos with poor colour balance and the person not smiling and the "with" photos with warm colour balance and a smile. These attachments will not magically cause improved colour balance, nor will they make the subject smile - don't fall for the dubious marketing. These are mainly intended for product photography and come in many shapes and sizes but are based on the same principal - a translucent surrounding so that light is coming from all angles resulting in minimal shadows. They are available from many suppliers and are widely sold on eBay where "no shadows" is pushed as a key feature. Light tents have their uses (especially when photographing shiny objects), but it is important to understand that although these will normally give better results than the built in camera flash (we should know that already), shadows are vital to making things look 3 dimensional, so removing them results in a very flat photo. It isn't as simple as the marketing for light tents would suggest. In order to make a light tent work for shiny objects (eg. chromed items, jewellery etc. ), black and grey cards are added into the light tent to block light and tailor the light hitting the object as well as reflections to give desirable shadows. This is not a simple subject that I can cover easily here. The high-end hot shoe flashes described above have another feature that is often very effective if used carefully. The flash head may be swivelled so that it can point away from the subject. While this may not make sense at first, when used indoors with neutral coloured walls / ceilings, the light can be bounced off a wall for indirect lighting. If the walls / ceilings are not neutral then you could end up with a colour cast being introduced which might not always be easy to compensate for. What this gives is that ability to use walls / ceilings as a light modifier - simply decide where you want the light to come from and point the flash head at the wall in that direction - the reflected light will effectively be from a much larger source (the lit area of the wall / ceiling) and give much softer shadows. There are some disadvantages of this - much of the light from the flash is absorbed or scattered away from the subject meaning that far more (often as much as 2 or 3 stops) flash power is needed for the same light. Also, natural light often means that the walls are strongest lit at the bottom, but when using bounce flash this can be inverted which may not give natural looking results even if shadows are soft and fall off smoothly. Bounce flash is none the less a very useful technique for indoor photography where circumstances force a compromise. I have a Fuji E900 compact camera which I think is one of the best reasonably priced advanced "coat pocket" sized cameras out there and can be carried around where I would not be able to (or want to) take an big, expensive professional dSLR. Like most compact cameras it only has a tiny built in flash and no options for using an external flash (which would also defeat the point of having a small camera). To be able to bounce the built in flash, I carry a small piece of plastic mirror (sold for making dolls house mirrors) which I can hold in front of the built in flash and reflect it against walls / ceilings to use it as a bounce flash. Like all small flashes it does suffer from lack of power and with the light loss from bouncing almost always under exposes when bounced like this (I have the flash level set to maximum), but none the less allows for much more pleasant lighting than direct flash and as I shoot in RAW, I can to a large extent compensate for the under exposure. The subject gets extra light which lifts them above the background and makes them stand out in the photo. Deep (dark) shadows are "filled" with light from the flash making them less extreme. A typical situation where this may be used is photographing people in bright sunlight -they will often be placed with the sun behind them (no squinting into the sun) which gives them a pleasing back/edge lit effect with highlights off their hair, but their faces are in shadow. The fill flash will lift the shadows on their faces and balance the lighting in the scene. In my experience, when using fill flash with automatic flash (eg. E-TTL mode, or almost all built in camera flashes), they will almost always be too bright. I often find that automatic fill flash needs to be reduced by between half and a full stop, and sometimes more. This can often be set with settings like FEC (Flash Exposure Compensation) in the camera settings, but remember when you are not doing fill flash to set it back to normal levels. Getting the best level will depend on the model of camera and may require some experimentation to find the best setting (or maybe multiple settings for different situations). With my little Fuji E900, the minimum setting is too much, and with my Canon dSLRs typically about -2/3 to -1 stop works well (the flash is normally already reduced in power as the camera is doing auto-fill when it detects the use of flash in otherwise adequate lighting conditions). The classic exercise in lighting is to photograph an egg - it is smoothly shaped with a similar texture to human skin so gives a good subject for experimenting as it doesn't change expression or move. To avoid distractions from colour, these shots have been done in black and white (lighting is critical for good B&W so a good exercise). 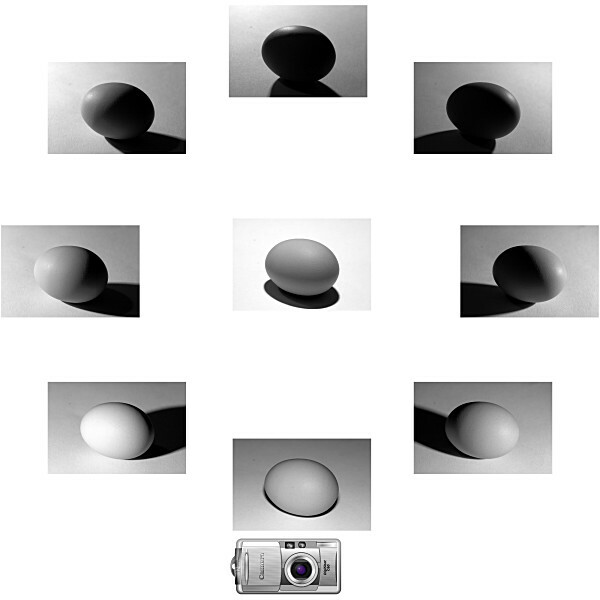 In the following examples, the camera and egg never move - only the lighting is altered between examples. Here the flash is was fired directly at the egg. 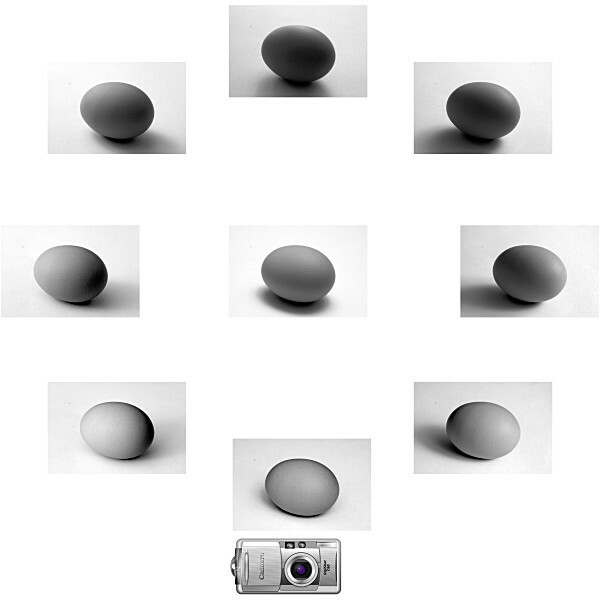 The photo of the egg for each flash position is placed where the flash was. Note the very sharp (harsh) light of direct flash, and the very flat light given when the flash is just above the camera as is typical with on-camera flash. Here the flash is was fired away from the egg to bounce it off predominantly white walls. This means the light comes back from a larger area (the lit area on the wall). 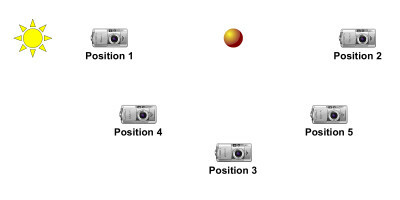 Again, the photo of the egg for each flash position is placed where the flash was. Note the smoother light giving a distinctly 3D, round shape with, but when the flash is just above the camera, the light remains flat. Lighting is one of the most important factors in getting a good photo, but probably the least appreciated and understood. Understanding lighting is something that takes time. If nothing else, developing an appreciation of the importance of lighting in photography will give you the ability to take advantage of good lighting conditions when they are available. If you want a more in depth understanding of lighting then I would recommend the book "Light: Science and Magic" by Steven Biver, Paul Fuqua and Fil Hunter. This book covers all the core principals and techniques for lighting as well as the reasoning behind them which gives a good foundation to learn from. If anyone is in doubt how important getting the lighting right is, I have added some examples of photos of stuff I have sold on eBay. When I list stuff on eBay I just use a camera with a bounced flash - yes, that simple.